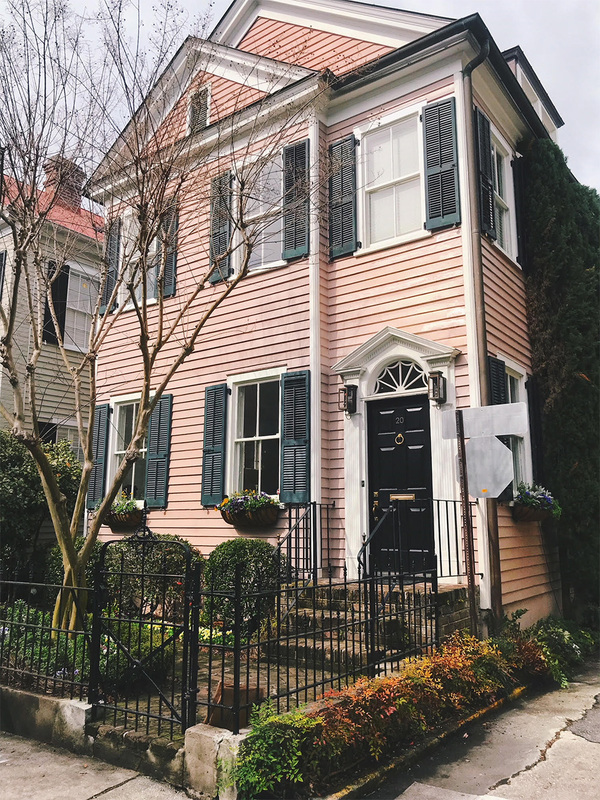 In case you missed my Instagram stories over the weekend or my blog posts for the past two days: James and I took a whirlwind day trip to Charleston on Saturday (I work for an airline so it’s very easy for us to get around!). In total, we spent a very short eight hours in Lowcountry, which was far from being enough time to truly enjoy this charming, gorgeous city. We also brought our pup because we wanted him enjoy a little adventure too, so we were slightly limited what we could do and where we could eat. But despite the super quick trip, I still fell fall head over heels for Charleston and am already thinking about when I can come back again! We started our adventure at Hominy Grill because it has 1) nearly 2,000 four-star reviews on Yelp and 2) a small outdoor patio that’s dog friendly. We arrived around 10:00 am and after sifting through some of the reviews, we were prepared to wait as long as we needed to for a seat. Turns out, there were only about six to eight parties ahead of us and they were getting seated pretty quickly. However, since we requested an outdoor table (there were only about six), it took us about 20-25 minutes to sit down. That ain’t nothing compared to NYC wait times, my friends! I got a perfectly spiced bloody mary to really kick off the trip and then ordered the Charleston Nasty Biscuit (aka the “Big Nasty” as it appears on your bill — ha! 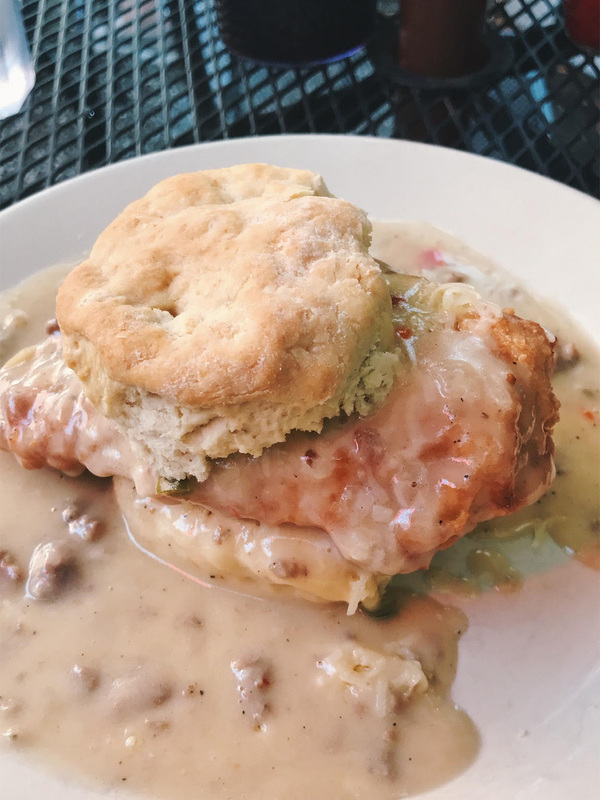 ), which is topped with a piece of fried chicken, cheddar cheese and the best sausage gravy I ever had. Every bite felt decadent! James ordered the Beef Creole Grit Bowl, which was also yummy, just not as good as mine! From there, we headed to Black Tap Coffee where we tried the lavender latte (amazingly herbal, but not overpowering) and the mint julep, which was espresso shaken with honey and mint over ice. The inside is pretty cute and calming, with lots of table space to post up and do work. James, and I sat outside on the bench with our pup, enjoying the warm weather while we waited for the caffeine to kick in. It was just what we needed to prevent us from going into a food coma after Hominy Grill. Next, we headed down King Street where there are a ton of shops. 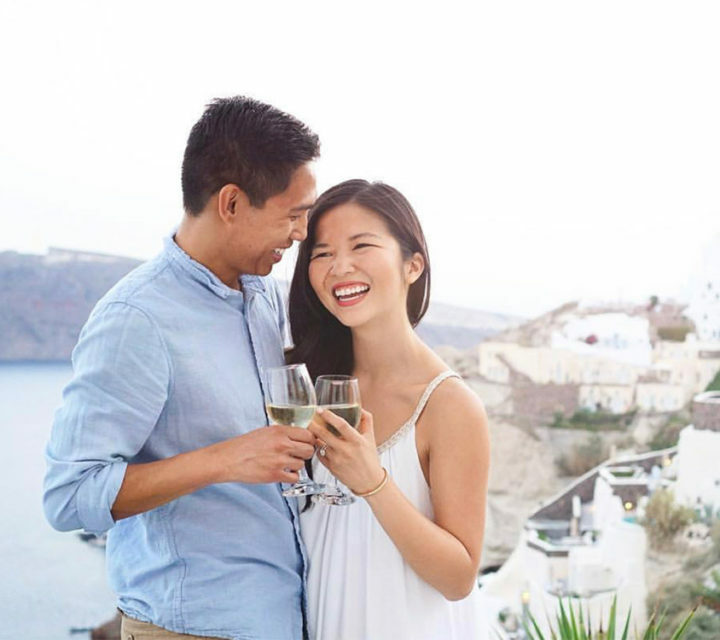 Everything from big box retailers like H&M, Madewell, Sephora and J.Crew to more local shops and art galleries. It’s pretty obvious why we came to Charleston (aside from the good weather and delicious food). 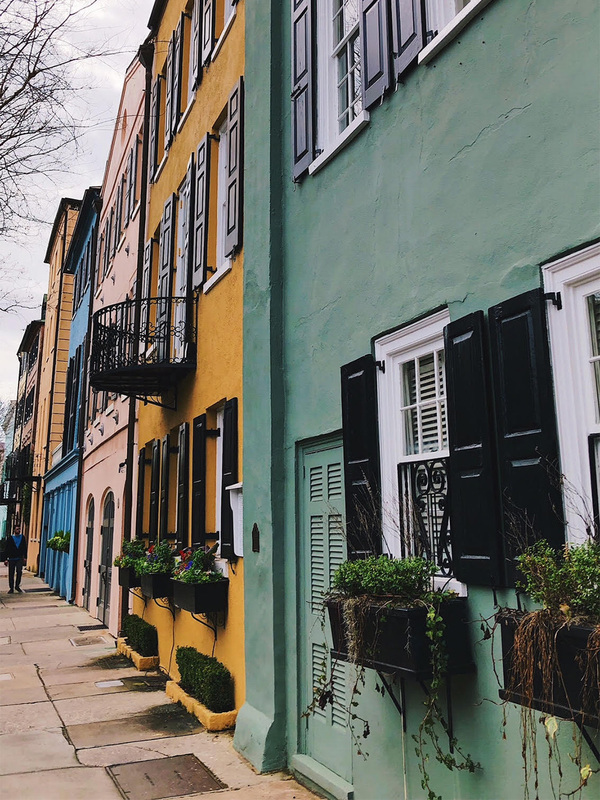 Rainbow Row is a charming stretch of blocks on East Bay Street and is probably the most popular street on Instagram these days. So it’s no surprise that I saw a swarm of bloggers taking photos while we were there. Obviously, I couldn’t help but jump on the bandwagon (you can see my first Charleston outfit post here). Just around the corner, towards the waterfront park, there was also a dog park that we let our pup run around for a bit. From there, we wandered some of the streets, with no particular destination in mind. We found a lot of gorgeous homes that way and I highly recommend exploring this area by foot! With only two hours left on our trip, we wanted to grab one last taste of southern cuisine. We went to Leon’s Oyster Shop on King Street, which also had a spacious outdoor area that’s dog friendly. 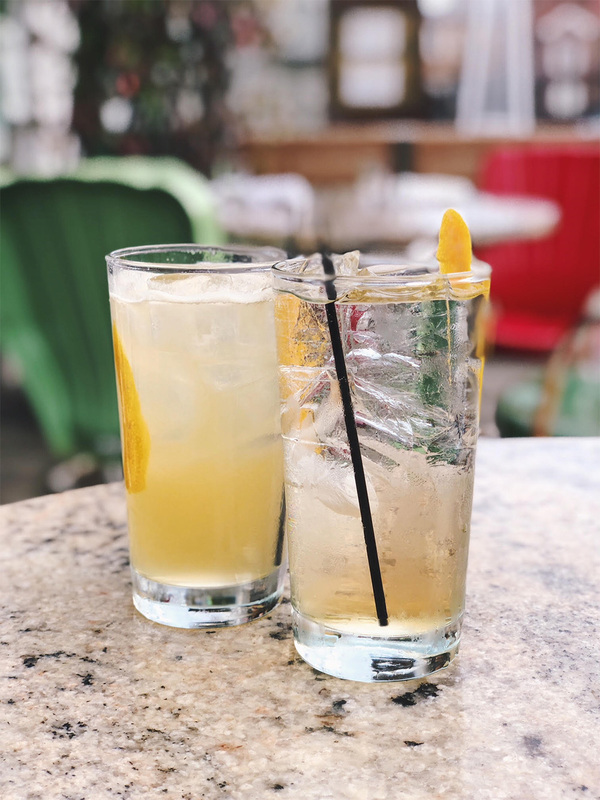 For bevvies, I ordered the Elderflower G&T (gin, elderflower tonic and celery bitters — pictured right) and James got the Whiskey Buck (rye whiskey, ginger, honey and lemon — pictured left). 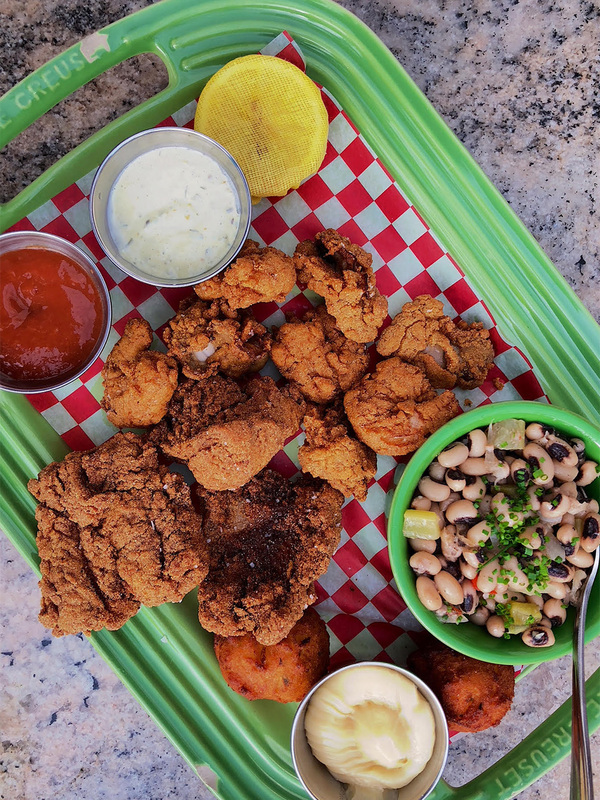 We also shared the fish fry plate, which was an assortment of fried shrimp, oysters, fish and hush puppies. The hush puppies were so good that we got another order to bring home with us to NYC. At this point, I felt like I was going to explode, but there was no way that I was going home without something sweet. A lot of people recommended Jeni’s, also on King Street, for a great selection of unique, creative flavors. 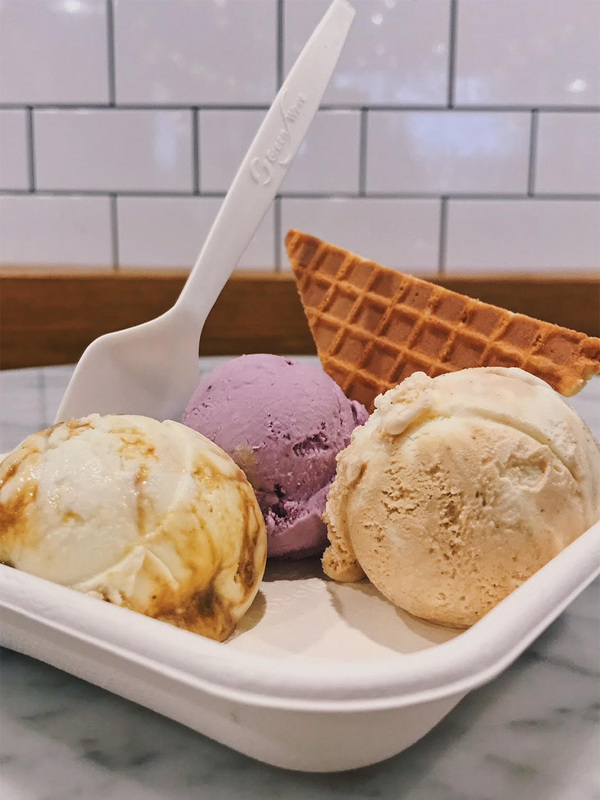 We got the tasting flight (a trio of half scoops) that included sweet cream peanut with molasses curd, wildberry lavender and coffee with cream and sugar. At the risk of sounding like a broken record, everything was so so good. Turns out there are quite a few locations including LA, Charlotte, Cleveland, Columbus, Washington, DC and they’re available in stores around the country. A little dangerous to know, but glad that we got to experience Jeni’s in one of their scoop shops. It doesn’t seem like a lot, but that was a full day of activity! I’m so glad we went, even if it was only for a short period of time. There are a lot more places to try and things to do on my list, so we will definitely be back! 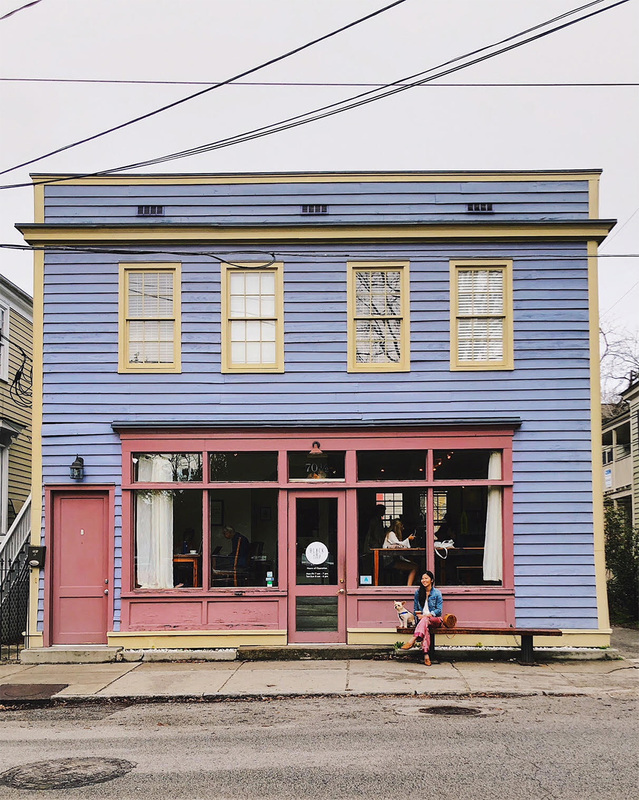 Have you been to Charleston before? I would love to here your recommendations for next time! I'm a communications professional in the airline industry by day and a style blogger on nights and weekends. Someday I WILL go to Charleston and take in the sights and eat all of the food! Everything you ate looks so delicious!! !